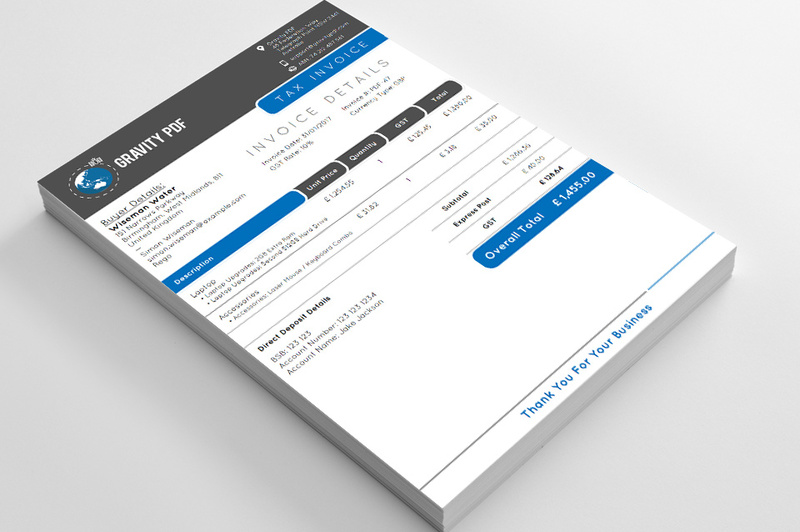 Invoice Aurora is a vibrant invoice template that can be purchased from our PDF Template Shop. This guide will walk you through installing and configuring Invoice Aurora to its full potential. As an Invoice PDF template, Invoice Aurora can be used with any Gravity Forms that include Product fields. You have access to your form data through Gravity Forms Merge Tags. For more information see the Gravity Forms Merge Tags documentation. All PDF templates have common settings that can be configured, such as font, security and PDF attachments. We recommend reviewing the PDF setup guide to get a better understanding on all the available settings. 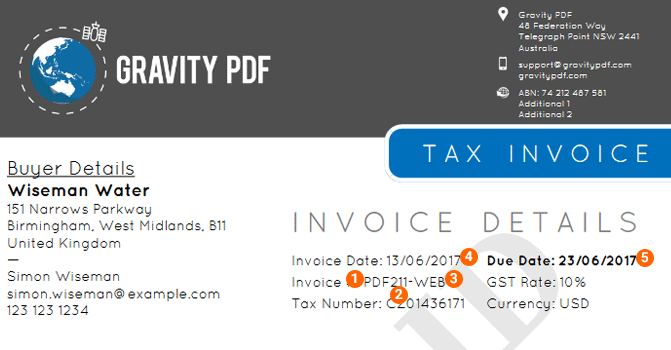 All template-specific configuration is done from the Template tab and below you’ll find detailed information about each option available in Invoice Aurora, what it does and how it alters the generated PDF. The logo is displayed on a coloured background. It’s recommended you use an image with a transparent background. You can set the due date in the PDF a specific number of days from the entry submission date. Enter the name of the individual or the company making the purchase. This is the label that will be shown next to the Tax Rate. Enter your company’s tax number (if applicable). For example, VAT-registered companies have a Tax Identification number, which should be included. 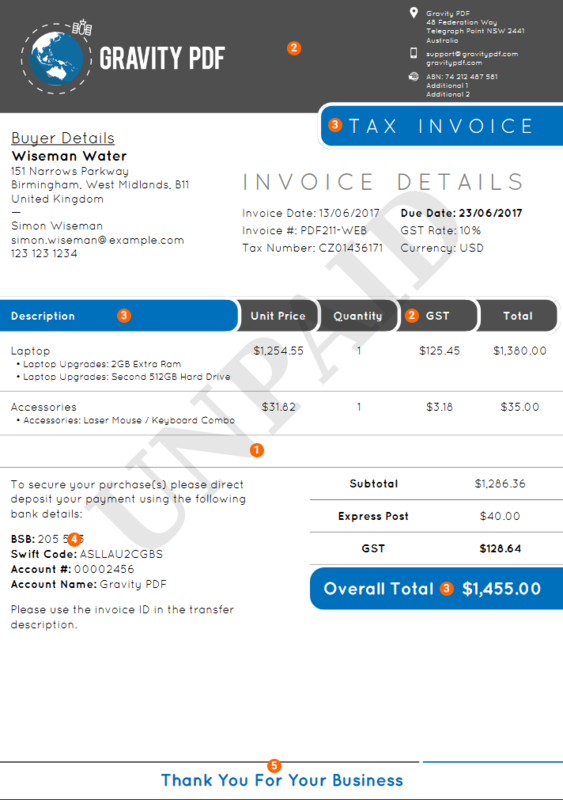 The background colour used for the [#title-label](invoice title), [#product-desc-label](product table description) and [#overall-total-label](overall total). The background colour used for the header and product table headings. This content is displayed to the left of the product table totals. This is the perfect place to include payment terms, thank you note, or delivery instructions. 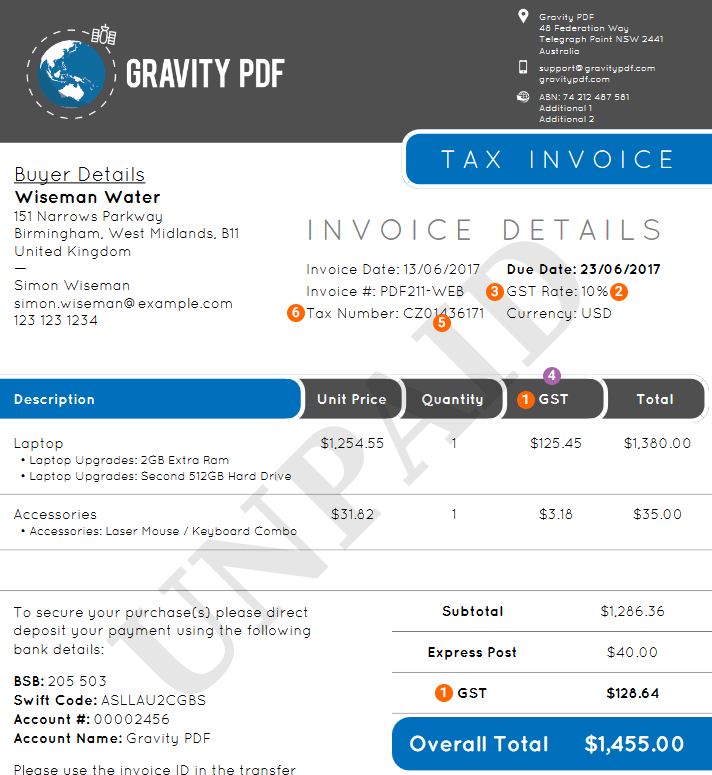 The invoice title that is displayed in the top right of the invoice. This label is displayed right above the summary section of the invoice. The summary includes the date issued, invoice number, currency and tax rates. Quicksand is an open source sans-serif font (SIL v1.1, Open Font License) that has rounded terminals and works well with Invoice Aurora at 12pt. Set the PDF font in the Appearance tab.